Australian firm Threadsmiths has managed to produce a t-shirt that's completely water-repellent, meaning your torso will remain moisture-free under drizzly British skies. The water-dodging tee is coated in 'superhydrophobic' nanotechnology that completely repels dirt and liquids, with Threadmiths promising that the fabric will remain 'dry and without stains'. "All manner of liquids bead up and completely roll off the surface of the fabric as they are unable to grip to the shirt's surface," says the firm. Typically, water-resistant coating is applied through a spray-on aerosol, but Threadsmiths says this destroys fabrics and can contain carcinogenic chemicals. The firm-down-under instead makes use of its own patented tech that's free from dodgy chemicals and is completely safe for regular wear. 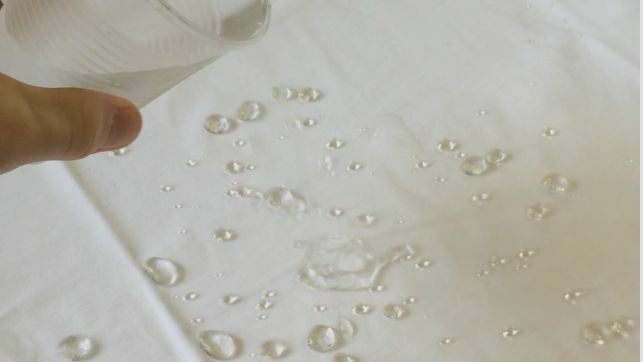 "The creation of this hydrophobic fabric technology has a myriad of potential future applications in the hospitality, medial, and industrial sectors," explains Threadsmiths. The Aussie company has kicked off its liquid-shunning tech with a t-shirt, but there's hopes to expand the range to include other garments. Possible ideas include cafe aprons that won't absorb hot liquids, truly waterproof sports hoodies, and even blood-repelling surgical scrubs. The 'Cavalier' shirt is promised to stay water-resistant for up to 80 washes, and will set would-be hydrophobes back $65 Australian dollars, which equates to £35.95 sterling. Any water-based liquid will be repelled by the shirt, so coffee, soy sauce, and even red wine are all game. Threadsmiths kindly sent T3 a sample tee to test out, which you can take a look at below.